Extract from the Act I Eiz. Cap I. Of note is the inclusion of the term `for ever`; and the recognition of past deeds by the catch all word `enormities` that could in future be applied to just about any act, word or deed that the Crown took offence at. Herein lays the basis for discontent in England. The law as such, if applied stringently, made it virtually impossible for anyone of the Roman Catholic faith to stay in the country. On the other hand, if applied equitably to protestant dissenters, they could be as worse off as the Catholics. This generates a subsequent dichotomy for the magistrates, judges and all law enforcement policy, since there was an innate reluctance to take an absolute, tough, line against the Puritans. VII. And to the intent that all usurped and foreign power and authority, spiritual and temporal, may for ever be clearly extinguished, and never to be used nor obeyed within this realm or any other your Majesty’s dominions or countries; may it please your Highness that it may be further enacted by the authority aforesaid, That no foreign prince, person, prelate, state or potentate, spiritual or temporal, shall at any time after the last day of this session of Parliament, use, enjoy or exercise any manner of power, jurisdiction, superiority, authority, pre­eminence or privilege, spiritual or ecclesiastical, within this realm or within any other your Majesty’s dominions or countries that now be or hereafter shall be, but from thenceforth the same shall be clearly abolished out of this realm and all other your Highness’ dominions for ever; any statute, ordinance, custom, constitutions or any other matter or cause whatsoever to the contrary in any wise notwithstanding. VIII. 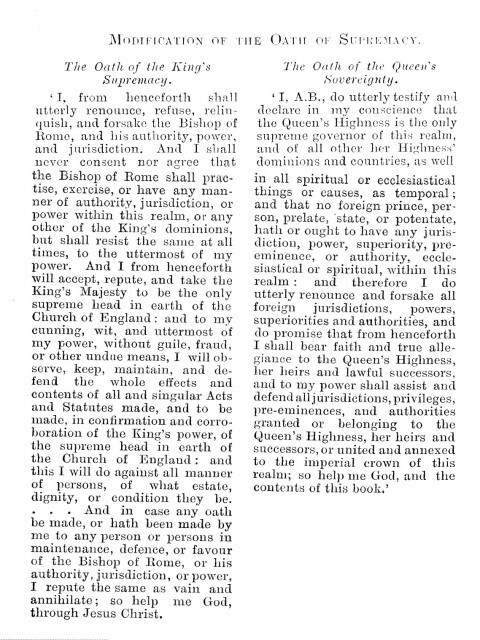 And that also it may likewise please your Highness that it may be established and enacted by the authority aforesaid, That such jurisdictions, privileges, superiorities and pre-eminences, spiritual and ecclesiastical, as by any spiritual or ecclesiastical power or authority hath heretofore been or may lawfully be exercised or used for the visitation of the ecclesiastical state and persons and for reformation, order and correction of the same and of all manner of errors, heresies, schisms, abuses, offences, contempts and enormities shall for ever, by authority of this present Parliament, be united and annexed to the irnperial crown of this realm and that your Highness, your heirs and successors, kings or queens of this realm, shall have full power and authority by virtue of this Act by Letters Patents under the Great Seal of England, in assign, name and authorize, when and as often as your Highness, your heirs or successors, shall think meet and convenient, and for such and so long time as shall please your Highness, your heirs or successors, such person or persons, being natural-born subjects to your Highness, your heirs or successors, as your Majesty, your heirs or successors, shall think meet, to exercise, use, occupy and execute under your Highness, your heirs and successors, all manner of jurisdictions, privileges and pre-eminences, in any wise touching or concerning ally spiritual or ecclesiastical jurisdiction within these your realms of England and Ireland or any other your Highness’ dominions or countries; and to visit, reform, redress, order, correct and amend all such heresies, errors, schisms, abuses, offences, contempts and enormities whatsoever, which by any manner of spiritual or ecclesiastical power, authority or jurisdiction can or may lawfully be reformed, ordered, redressed, corrected, restrained or amended, to the pleasure of Almighty God, the increase of virtue and the conservation of the peace and unity of this realm; and that such person or persons so to be named, assigned, authorised and appointed by your Highness, your heirs or successors, after the said Letters Patents to him or them made and delivered as is aforesaid, shall have full power and authority by virtue of this Act and of the said Letters Patents, under your Highness, your heirs or successors, to exercise, use and execute all the premisses according to the tenor and effect of the said Letters Patents; any matter or cause to the contrary in any wise notwithstanding. I, A. B., do utterly testify and declare in my conscience, that the Queen’s Highness is the only supreme governor of this realm and of all other her Highness’ dominions and countries, as well in all spiritual or ecclesiastical things or causes as temporal, and that no foreign prince, person, prelate, state or potentate hath or ought to have any jurisdiction, power, superiority, pre-eminence or authority, ecclesiastical or spiritual, within this realm; and therefore I do utterly renounce and forsake all foreign jurisdictions, powers, superiorities and authorities, and do promise that from henceforth I shall bear faith and true allegiance to the Queen’s Highness, her heirs and lawful successors, and to my power shall assist and defend all jurisdictions, pre-eminences, privileges and authorities granted or belonging to the Queen’s Highness, her heirs and successors, or united or annexed to the imperial crown of this realm : so help me God, and by the contents of this Book. to the Oath of Allegiance – comparison. supremacy of the sovereign in the Church of England.